CONTRARY TO LEGEND, Columbus did not sail to prove the earth was round. Most educated Europeans and mariners already knew that. 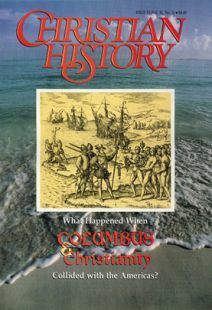 Columbus estimated the size of the Atlantic Ocean partially from reading his Bible. He had read in the Second Book of Esdras (in the Apocrypha) that God created the world in seven parts, six of them dry land and the seventh water. He thus calculated that the ocean separating Portugal from Cipangu (Japan) was one-seventh of the earth’s circumference, or about 2,400 miles. He figured that by sailing 100 miles per day, he could reach the Indies in 30 days. Unlike many sailors then and now, Christopher Columbus never used profanity. During Columbus’s voyages, the ships’ crews observed religious rites. Every time they turned the half-hour glass (their primary means of keeping time), they cried: “Blessed be the hour of our Savior’s birth / blessed be the Virgin Mary who bore him / and blessed be John who baptized him.” They finished each day by singing vespers together (although reportedly they sang out of tune). Not until his third voyage did Columbus actually land on the American mainland. Seeing four rivers flowing from the landmass, he believed he had encountered the Garden of Eden. He died in 1506 unaware he had landed thousands of miles short of the Orient. Between 1493 and 1820, Spain sent some 15,585 missionaries to the Americas. Typically the government of Spain paid their full expenses. In the first fifteen years after the Spanish conquest of Mexico, Franciscans baptized about 5,000,000 Indians; priests in Mexico sometimes baptized thousands in a day. Spanish missionaries attempted to establish colonies in present-day Georgia and South Carolina in 1526. In 1542, Dominican Juan de Padilla planted a cross in present-day Kansas. Reformer John Calvin sent two Protestant pastors to accompany a Protestant expedition to Brazil in 1556. Upon arrival, however, the leader of the expedition betrayed the settlers, and the project was abandoned. A Catholic-Protestant “holy war” nearly erupted in present-day Florida in the late 1560s. Spanish leader Menendez de Avilez attacked and murdered French Protestant (Huguenot) settlers. Later the French sent a party to kill the Spaniards. There was an Inquisition in the New World. It was established in 1570 and lasted until the 1800s. Yet the Inquisition was relatively lenient toward Indians, saving most of its ire for Spaniards. In fact, mistreated Indians and African slaves learned to cry, “I deny God!” They would then be placed under the jurisdiction of the Inquisition, which was more benevolent than their masters. San Diego, Santa Barbara, and the rest of the famous 21 missions of California, most founded by Franciscan Junipero Serra, were not the most successful North American enterprise of the Spaniards. They established 25 missions in New Mexico and 44 in Florida. Usually, native Americans could serve in churches as interpreters, acolytes, and even teachers, but they were not allowed to become priests or friars. Conquistador Hernando Cortes was greedy and violent, yet deeply religious. He sometimes preached the gospel, and he allowed himself to be publicly whipped for neglecting to attend worship. He once cried upon seeing a cross beside the road. The first Christian worship service in North America was celebrated in Florida on August 25, 1563, the feast of St. Augustine. Formally founded in 1565, St. Augustine remains the oldest continuing settlement in the U.S.
Because of Columbus’s voyage and the resulting Spanish evangelistic efforts, Latin America has a higher percentage of professing Christians than that of any other region in the world.